Several weeks ago, I came across an interesting post by Paolo Emilio Serra at Punto Revit. He had found a video by Mustafa Khalil at Architecture for Humanity. The video demonstrated a Revit Add-In that was developed to make Topography follow a shape-edited Floor (or Roof). Serra then proceeded to make and share an API code that also makes Topo follow/ align to a Floor. I was intrigued, as this would be highly useful to anyone working with shape-edited Floors and Topo. So, I decided to investigate both options: Khalil’s Add-In and Serra’s API code. After contacting Khalil, he sent a demo version of the Add-In (and was generous enough to send a 2014 version). The demo version does not allow you to save Revit once the Add-In has been activated/ used. Once installed, it appears on its own ARCH4HUM Ribbon. The dialogue box is fairly straightforward, though it is explained in more detail here. The result is pretty good. I appreciate that it follows the Inside Edges of the Floor, which makes for a more accurate alignment. This is an interesting Add-In, though I did not inquire into how much it costs. If you are interested, his contact information can be found under the youtube video. The Revit API is accessed from the Macro Manager button, on the Manage ribbon. I do not have a lot of experience with API in Revit, but I was able to get this one to work. If you have never used API, Henry Mattison at Boost Your BIM has a nice video post on how to create a basic macro. After running the AlignTopo Macro, this is the result. As you can see, the results are different. The code does not distribute the points as evenly or along the Interior Edges. But when compared, side by side, the two Topos look almost identical. However, with trickier Topo, I would guess that the API would not perform as well, since it does not follow the Interior Edges. If the API created points along the Interior Edges, then the two methods would be essentially the same and equal. Kahlil mentioned that he currently working on another Add-In that will do the “opposite,” or align Floors to Topo. This is interesting, and if combined, the two functions would be a very powerful Add-In. Even though (as Serra mentions) Marcello Sgambelluri has a workflow for making Floors follow Topo, it is a bit cumbersome and prone to errors. 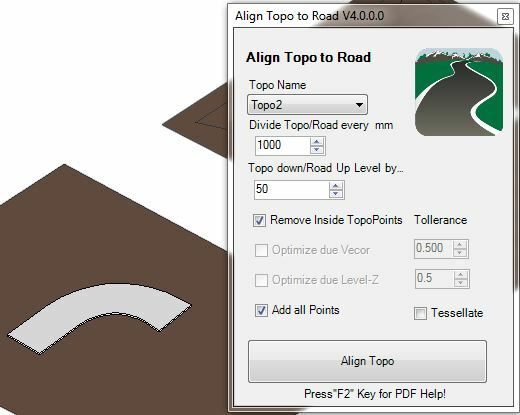 Finally, what I find most compelling is that there are ways that Revit can make Topo follow Hardscape and vice versa. It is only a matter of time before this is captured and incorporated as a standard Revit tool. Ah ha, I see you’ve found the path of enlightenment! SiteDesigner formerly of Eaglepoint has now been integrated into Revit 2015 as I’m sure you knew. That can create toposurfaces and other landscapey bits and bobs. Personally I don’t rate toposurfaces at all, they’re inaccurate, the algorithm for creating them is arbitrary at best about where it sticks points.I guess once could make a better toposurface creation tool, but what would you get out of it? The path of enlightenment? Are you referring to using API? You’re exactly right – you need both functions. When we’re laying out streets on a new site, we normally just want to drape them over the topo until things are firmed up. Then later you might want to cut the topo to make the street gradients smoother etc.